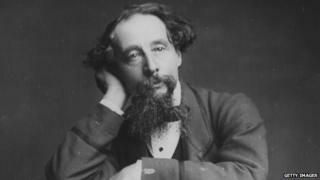 Charles Dickens statue: Why was his dying wish ignored? Charles Dickens stipulated that when he died there should be no memorial to his life, save his writings. However, his home city of Portsmouth has now erected a statue to the celebrated author. Should the will of England's greatest novelist have been respected? "I conjure to my friends on no account to make me the subject of any monument, memorial or testimonial whatsoever. I rest my claims to the remembrance of my country upon my published works." Those were the words of Charles Dickens' will as he stipulated his wishes for his funeral in 1870. And for 144 years there has not been a statue of him in his homeland - until now. On what would have been the author's 202nd birthday, a bronze statue of him has been unveiled in Portsmouth, the city in which he was born. "I direct that my name be inscribed in plain English letters on my tomb without the addition or Mr or Esq. "I conjure my friends on no account to make me the subject of any monument, memorial or testimonial whatever. "I rest my claims to the remembrance of my country upon my published works." More than 40 of his descendants were at the ceremony and many helped to meet the £140,000 cost. But what would Dickens have thought? Ian Dickens, his great-great grandson, thinks the line from the will has been taken out of context. "It was simply a personal note to his friends ahead of his funeral," he said. "He could not look into the future. He could not possibly imagine that his popularity would have been what it is today. "If anything it would have been arrogant if back then he believed that in 200 years he would still be celebrated. For all he knew the fame might have faded 20 years after his death." Other stipulations in Dickens' will were not followed either. "He was buried in Westminster Abbey," Mr Dickens explains. Image caption Jane Monk, Dickens' great-great granddaughter, has visited both other statues and says: "Why should Philadelphia and Sydney have statues and not England?" "That was not what he wanted, he wanted to be buried in a quiet church, but a grieving nation decided otherwise. "I think most people are surprised there isn't a statue of him here. There are monuments, plaques and busts commemorating him all over the place, but no statue." Mr Dickens does not think his great-great grandfather would have been opposed to the plan. "I think he would have been incredibly touched if he knew about this and how loved his work is to this day." He published a series of sketches under the pseudonym "Boz"
Another of Dickens' descendants, great-great granddaughter Jane Monk, has visited statues of Dickens in Sydney and Philadelphia and believes it is "wonderful" there will one of him in Portsmouth as well. Previous attempts were made to erect a statue in Kent, where Dickens lived and wrote many novels, ahead of the bicentenary of his birth in 2012. However these were abandoned in 2009 due to opposition by Dickens enthusiasts. "Charles Dickens made it perfectly clear he did not want a statue erected in his memory," said Christine Furminger, secretary of the City of Rochester Society. "He had seen far too many vainglorious and ridiculously elaborate monuments erected in London and elsewhere and I daresay he felt money could be better spent. "Portsmouth should not go against his express wishes. Why make a will? The fact that a long period of time has elapsed since his will was made does not alter anything." The Dickens Fellowship - founded in 1902 with branches worldwide - states it "holds no single corporate view on the issue". However, John Knott, vice president of the Rochester and Chatham Dickens Fellowship branch in Kent, said he also opposed the statue. "I won't be rushing down to see it, put it that way," he said. "Dickens clearly stated in his will he wanted no other memorial than his published books. Because of that most Dickensians are completely following that to the letter. "We don't mind the statue being of one of his characters, but not portraying him." He said the Dickens Chalet and St Mary the Virgin church in Chatham - mentioned in both David Copperfield and The Pickwick Papers - needed saving and were more deserving of the money. Steve Martin, secretary of the same branch, said: "This is not a new dispute." "There was historically a move to block the purchase of the building that now houses Charles Dickens Museum in London by die-hard explicit will believers as it could be interpreted as a monument." The fact is Dickens' wishes have never been entirely respected since his death. Hundreds of thousands of people queued to walk past his open grave in Westminster Abbey in the days before his funeral, despite him stipulating that "no public announcement be made of the time or place of my burial". It has been suggested that Dickens said that in an attempt to ensure his mistress Ellen "Nelly" Ternan could attend without attracting publicity. Dickens' dying wish of having no statue was actually first broken in 1891 - just 21 years after his death - when a life-sized bronze statue was erected in Philadelphia. At about the same time another was erected in Sydney, where two of his sons had emigrated after his death. Actor and author Simon Callow, who has played the writer on several occasions and wrote the biography Charles Dickens, welcomes the new statue in Portsmouth. "Dickens, of course, never wanted a statue, just as he never wanted to be buried in Westminster Abbey," he said. "But such was the overwhelming force of his personality that we need him with us, among us. And with this statue, he is. "A permanent presence, immersed in the act of dreaming, his characters swirling around in his head, about to leap out on to the page. "It's a fine, private moment for a man who lived as deeply in his imagination as he did in the world. "He belonged to the inner and the outer life, and it's wonderful that his moment of creation should be honoured in his birthplace."